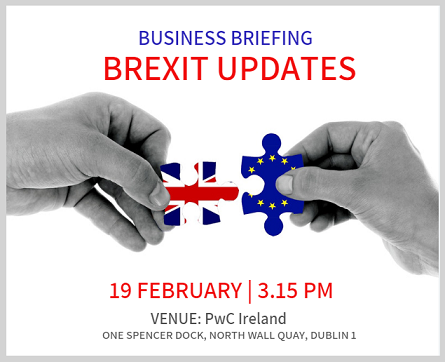 It is our pleasure to invite you to attend Business Briefing: Brexit Updates organized by JETRO London and PwC Ireland. With Brexit deadline just around the corner, this will be a great opportunity to hear the latest economic updates and how Brexit could impact businesses in Ireland. For Japanese speaking audiences, this is a rare chance to hear Brexit topics briefed in Japanese by expert research team based in UK. Presentations will be followed by networking – canapes and drinks. To register for this event, please RSVP by Wednesday, 13th February by email: info@ija.ie or call: 01-6787008. Please download your Invitation Card HERE! Event is organized by JETRO London and PwC Ireland. Event is supported by Ireland Japan Association.